... separate torque testers and electronic torque wrenches. • First peak of torque mode allows hand calibration of click type torque wrenches. • Memory for traceability. 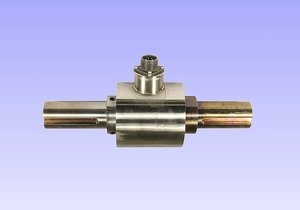 Torque transducers measure the torsional force applied between the two sides of the torque transducer. Reaction torque sensors, also known as static torque sensors, measure the torque applied to an object that is not in rotation. The reaction torque is the rotational force applied to an object such as a bolt or stationary drive shaft. Reaction torque sensors are used in electronic torque wrenches to control the torque applied when tightening bolts. They also can be used in different product test applications. Drive shafts can be tested during manufacturing to verify their ability to withstand maximum and minimum torque levels. Reaction torque sensors are most commonly made of steel with varying shaft configurations. Most reaction torque sensors use strain gauges to measure the stress/strain induced on the sensor when an external torque is applied. Be sure to specify the maximum and minimum loads for the intended application when selecting a reaction torque sensor. Other parameters are the shaft type and its size.